Between our Thanksgiving and Christmas feasts, December is peak time for leftover food. But while you’re hard at work in your kitchen, putting those leftovers away, stop for a moment to consider what the best container for the job is. For decades, Tupperware was the reigning king of the food storage world. The name Tupperware itself became synonymous with any reusable plastic container with a tight-fitting lid. But is Tupperware still the great defender of leftovers? Consumers have a ton of options these days. Concerns over the link between BPA — a substance commonly found in some plastics — and myriad health problems including cancer and heart disease, have driven many consumers away from plastic in recent years. Producers of plastic containers, including Tupperware, have shed BPA from their products in recent years in response to the reports, but many consumers continue to steer clear of plastic containers as new safety concerns surface. While plastic certainly wins the trophy for durability, a 50-cent glass mason jar often will get the job done just as well, while allaying fears of potential lurking carcinogens. Glass and ceramic containers also win out in the microwave. Microwaving plastic containers often leaves behind an odor and a thin film that require repeated scrubbings to eliminate. Resealable glass containers, like the ones from Pyrex and the Anchor Hocking Company, provide the best of both worlds and are oven safe, so you can make a casserole and stash the leftovers in the fridge without having to transfer it to another container. Just as you may have upgraded your kitchen, Tupperware has updated its classic containers in recent years. Their line now includes such innovations as vented lids, "on-the-go" sets and new container shapes that make almost any food portable. Although they're produced some unitaskers (like an egg-server tray), Tupperware maintains their classic cache while dabbling in new, modern designs, so we give them an A for effort. Rubbermaid, one of their bigger competitors, has added some great utilitarian items to their food storage line, but when it comes to pretty colors and cute designs, we think Tupperware is still leading the pack. Health concerns aside, many people still like plastic for its shatter-proof durability. But when it comes to plastic containers, does Tupperware still reign supreme in the quality department? The popular cooking show “America’s Test Kitchen” recently put an assortment of plastic containers to the test. They got the best results with containers that replaced the simple press-down lid of traditional Tupperware with a silicone gasket and snap-down flaps that allow the lid to tightly grip the base and seal in freshness. Tupperware brand products were not included in the test, but we mention them in this context because Tupperware (unlike Rubbermaid) does not offer a snap-lid-and-gasket-style container, which was the winner. Crowning a winner, “America’s Test Kitchen” declared the Snapware-brand container provided the best seal, and retained its sealing power even after 50 cycles in the dishwasher. While quality is certainly a consideration, consumers aren’t always looking for the best product; often the cheapest solution to accomplish a job is the best option. Semi-disposable containers from companies such as Glad and Ziploc have flooded the market in recent years, offering consumers a product they don’t have to worry about losing at work or leaving at a friend's place after a dinner party. These bare-bones containers may warp in the dishwasher or crack if they fall from the freezer, but for the most part, they get the job done, and they do it cheaply. For many people that’s all that matters. 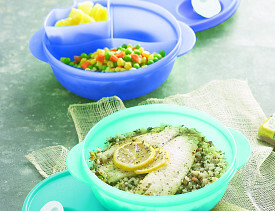 Many people still love Tupperware, and the company still puts out a quality product. But their supremacy has been challenged by other companies who realize that no one container can suit everyone’s needs. For the health conscious, glass is the way to go. For the budget-minded, a cheap disposable container is good enough. And for those willing to spend a little extra, Snapware is the new king.